There are no rules to art journaling. You get to play using color, words and images. Art journal on cold-pressed watercolor paper or a box of Chex. Artist quality paints or cheap acrylics. Graffiti grunge or elegant typography. Just have fun, explore, create, get messy. This was a fun page to put together; it has a little bit of everything! I’m always looking for spare moments to make progress on something creative, like drawing mandalas or embroidering. The first layer of this art journal collage was written while my daughters were in swimming lessons. I wrote pretend bits of short fiction in the form of slow journaling. Little mini-stories of detectives searching for clues, a lavish purse, and personal trainers pushing vitamins. Writing each letter slowly, constrained by the wavy lines, allowed time to have fun with the words. Later (as in months), I added bits from an old children’s math text (discovered in my dad’s attic), quotes, paint chips, maps, psychedelic batik cardstock, cotton fabric stamped with a handmade FIMO stamp, fluid acrylic paint, even a 35mm slide case. 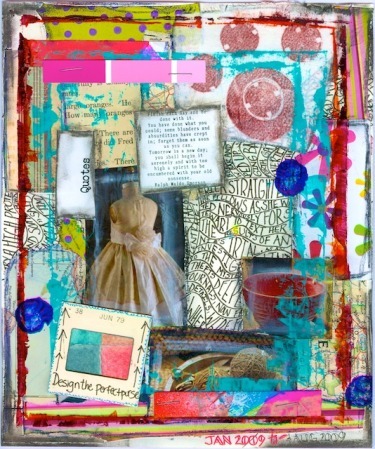 Have you tried the Kick-Start Art Journal Prompts? Editor’s note: If you’re ever in search of creative inspiration, go immediately to Daisy Yellow — do not pass go, do not collect $200 — just go. Tammy’s blog is one of the very best blogs in the artful blogosphere — never fails to delight the senses and empower the creative soul. ← Robin: That ONE THING Essential to Your Survival — What Is It? Tammy, I am trying to find a word to describe the depth and beauty of this piece-INCREDIBLE is too small of a word. tammy amazes me! i love daisy yellow and she’s really encouraged me to ‘free up’ in the process of creating with my children. that iris murdoch quote is one of my favorites of all time! knew i loved this the minute i saw it, and then when i saw where it was cross-posted from, i knew why! i love tammy’s blog and visit regularly. chock full of inspiration! thanks tammy! p.s. LOVE the new header. Miranda!